What is Anonymous types ? Anonymous types are the new concept in C#3.0 which allow to create new types without defining it. Why Anonymous types introduced in C#? 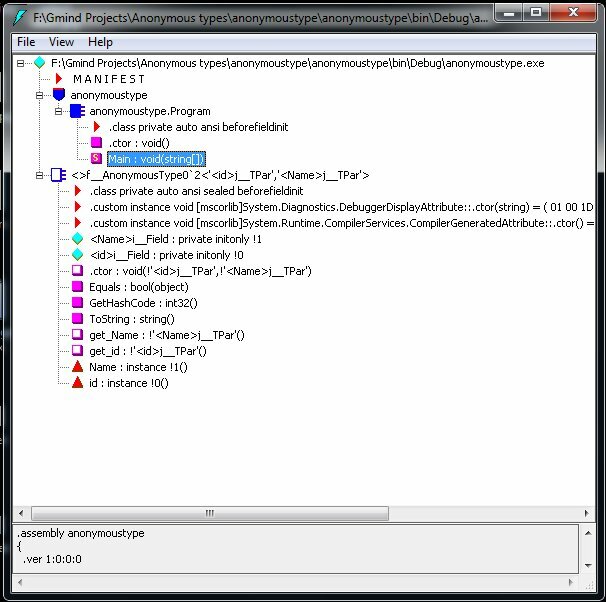 Anonymous types introduce to support one of the most use full feature called LINQ. It's most use full when you are querying collection of object using LINQ query and you want to return only few property of it. How to define Anonymous types ? here as you see select new i.e second line of code generate anonymous type. Consider below code to understand Anonymous type in more detail. After compiling code. 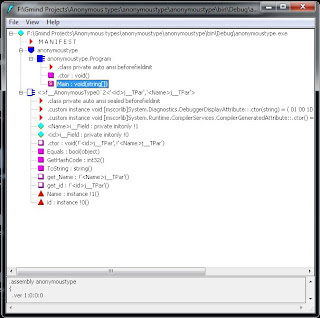 When you see your dll or exe file in ILDASM it's shows code generated by compiler. IL_0042:  ldstr      "Person : "
IL_005d:  ldstr      "Person : "
Anonymous types are reference type derived form system.objects. Properties of the Anonymous type is read only. If two Anonymous type has same properties and same order than compiler treats its as same type. But if both are in one assembly. Anonymous type has mehtod scope. If you want to return Anonymous type form the method than you have to convert it in object type. But is not good practice.